Last year, there were reports about Käuferportal in Germany's big print media: the Frankfurter Allgemeine Zeitung, Süddeutsche Zeitung and Die Zeit newspapers. The Bayrische Rundfunk (Bavarian Radio & TV) featured our services. We also launched the first TV ad for our immobilie-richtig-verkaufen.de webpage and got off to a winning start in 2016 with three prizes. In January we won the Focus magazine's Digital Star award. That places us among the 21 most innovative digital concepts in Germany. Our business model prevailed against more than 100 competitors. This is the fourth time this prize, initiated by the Hubert Burda Media group, has been awarded. Its objective is to find and promote innovative business models in Germany. manager magazin counts us amongst Germany's top 50 technology companies in its March issue. That places us in the same league as Zalando, Teamviewer, Soundcloud and Delivery Hero. 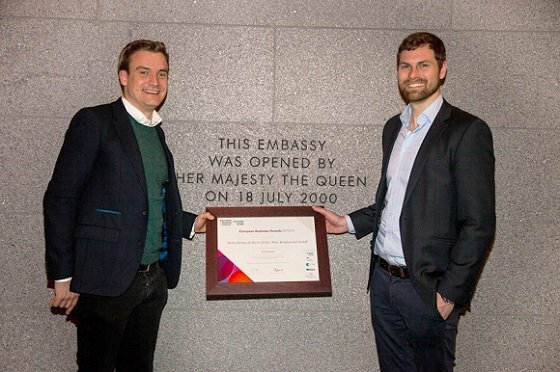 In February, our CEO Mathias Klement and founder Mario Kohle received the title as National Champion at the British embassy in Berlin. The prize is awarded annually as one of the European Business Awards. Each year, about 30,000 businesses from across Europe compete for the EBAs, which recognise innovative business ideas and promote networking among European companies. And the Berliner Morgenpost newspaper has taken an interest in Mathias Klement. He was featured in the 20th March 2016 edition in the "Junge Profis" (Young Professionals) series as a person with an exciting career path. Mathias started as an intern in 2010 and made it to CEO in just five years. It will be interesting to see what the media has to say about us in the second half of the year. It is always worth having a look at our media page.